The Digital Arts and New Media MFA program at UC Santa Cruz presents an exhibition of eleven graduate students whose works employ advanced technologies for creative potential and social impact. Entitled, I'VE GOT SOMETHING ON YOUR MIND. presents the work of eleven MFA candidates who employ advanced technologies for creative potential. Through storytelling about places, times and players, these artists experiment with digital media to produce unforeseen, imaginative outcomes. On Friday, May 4, 2012 Scott McCloud, renowned artist and author of many books including the comic book "Understanding Comics: The Invisible Art," will speak as part of the Art, Technology and Culture Lecture Series at 4pm, followed by a reception with the artists from 5:30 to 8:30pm. Digital Arts and New Media at UC Santa Cruz is a Master of Fine Arts graduate program where faculty and students create and study digital media arts and their social impact. 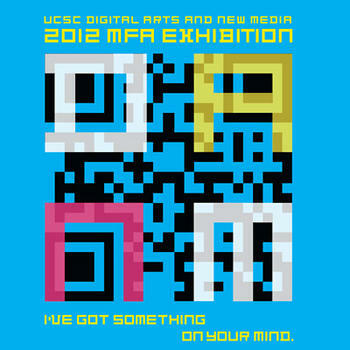 From its home in the new, state-of-the-art Digital Arts Research Center (DARC), the DANM MFA Program brings together the arts, engineering, the humanities, and the sciences to produce artistic and scholarly research in the context of a broad inquiry into digital arts and cultures. A critical component of the DANM MFA Program is collaborative, faculty-led research. Students' core courses explore theory and practice, complemented by a range of electives and opportunities for exhibition. Two years of intensive study culminates in the development of individual thesis papers and projects, which premiere in an annual MFA exhibition. The MFA is a terminal degree in the arts and qualifies graduates for a variety of career paths including university-level teaching and research. Science fiction adventure! Extinction looms for the fish, the people, the entire planet of Traglea. Can one bumbling space cadet rescue and clone enough alien fish before it's too late? Can he learn the secrets of Traglean karate? Find out... and help save the planet! Journey Through Light is an interactive, group adventure around the DARC. Participants with glowing orbs move about a landscape of dispersed sculptures, activating embedded sound and light elements. In the spirit of play, participants are asked to temporarily exchange their cellphone for an orb and engage only with their immediate environment for the duration of the experience. These two projects explore the relationship between the digital archiving of culture and technology’s impact on culture. Everybody’s Google repurposes personalized Google search results to explore the company’s underlying models of the Internet. Ocular Character Recognition reconstructs digital text documents into files undecipherable by computer algorithms, yet understandable to humans. Advertisement is everywhere – in magazines, on TV, the Internet, plastered over shopping malls and urban areas. Together all these advertisements form a mass media spectacle of desire, fantasy, and above all, consumption. Sabrina Habel’s multi-media series “Seeing Spectacle” uses off-beat humor to confront the essence of advertising. Game/Reality Workshops is a series of live art game making events. The events presented at the show are one facet of the Gaming Reality Project, an art initiative which empowers communities to envision new realities for themselves through game creation and play. Immersive digital cinema, composed entirely of appropriated web content, re/assembled as animated loops and remixed in real-time by the viewer’s fluctuating brainwave rhythms. Oscillating between visual perception and mental observation, the viewer navigates an infinite labyrinth of multiple, discontinuous, collective memories dis/re/embodied in networked media. Internal Worlds is a two-part installation using video, and biosensors to detect the participant’s pulse. This internal rhythm is externalized through pulsing lights, and altered to represent the heart rates of different species. The pulse's continuity is broken as participants viscerally experience another's biorhythm. Mystery Play invites its audience to watch, and interact with, a group of players as they explore an alternate world. It blends elements of found sculpture and spontaneous art creation to tell a unique story about choice, growth, and the Apocalypse: the moment when all secrets are revealed. Title: "My Future Is Here"
“My Future Is Here” is a site-specific project that brings to light the most pressing issues immigrant youth face when making a new life in the global city. Produced with students in Queens, New York, this multimedia project utilizes immigrant narratives and social intervention to foster public engagement and exchange. be there is a shared online virtual environment where time spent in other souls is the only way to create your self. give up individuality and reincarnate in a distant body to collect the patterns of sound and light necessary to build a personal audiovisual structure. transform and persist. The Loop is a stop-motion animation short exploring human relationships with anxiety. In this animation, the viewer watches the main character and her response to an abstract feared element. Through the use of a metaphorical structure, the character mechanically and externally processes reactions which typically happen in one’s thinking patterns.